This stand-alone two-player Lord of the Rings game is designed by master game designer Reiner Knizia and illustrated by acclaimed Tolkien artist John Howe, the duo behind the bestselling core Lord of the Rings board game. 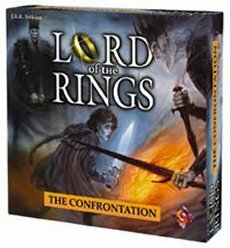 In this wonderful game interpretation of the novels, the Fellowship must seek to bring Frodo to Mordo, and the dark lord Sauron must seek to capture Frodo and the One Ring before Frodo reaches Mt. Doom. Each player controls nine characters who each have a unique special ability (the nine characters of the Fellowship are controlled by one player, and nine of Sauron's greatest minions are controlled by the opposing player). The game uses a hidden movement system to simulate the search for the ring, and the conflict resolution system is a brilliant cardplay mechanic from a limited resource pool of cards. The dark lord Sauron is stronger and projects more power, but the Fellowship have more devious and surprising maneuvers at hand. The straight-forward gameplay of The Confrontation allows each game to be played in about a half hour. Great strategy and fun. Other products in the "Lord of the Rings" series. Stratego with something extra! Great Stratego-lite game with a few extras thrown in. We really like the special powers of the pieces, as well as the light and dark sides working so differently. Play two games, switching sides, in under 30-45 minutes. I really enjoy this game. It allows me to get my game on when I only have one opponent(usually my girlfriend). A definite buy. My favorite 2-player game ever. LOTR: The Confrontation is the kind of game you can play over and over again, without it ever getting old. In fact, one of its best aspects is how players' strategies evolve with each play. Another excellent strength of this game is its exquisite balance despite each player having utterly different pieces. Finally, this is Reiner Knizia's most flavorful game. At less than $15, this is a steal. I loved Stratego growing up, I loved the LotR movies, so this game was obvious for me. However, I haven't found anybody who seems to enjoy the game as much as I do around my house. Regardless, if you like a quick LOTR game, its going to be a hit! A stratego-like game with a very strong theme. I really like that every character has an ability that makes sense. It plays fast and I always feel like another try after playing it.